While on the process of handy work, we often find ourselves needing to join two materials to produce an output. Though, in this modern century, the ways of the connection process continue to improve to benefit one’s job. One of the most well-known progress is stick welding, which introduces an easy technique for this occurrence. To know more about its technique and uses, this text is provided with the aim to achieve a better experience in terms of the stick welding possibilities! 1 What is stick welding? 2 Key Preparations before welding: How does it work? 5.1 Do I have to remove any remaining rust or oil on the surface before conducting the process of welding? 5.2 Are there any advantages when using an AC output? 5.3 For generalized usage, what type of stick welder works best? The nomenclature of stick welding can also be associated with the term of shielded metal arc welding (SMAW). It is relatively known due to its simple technique and uncomplicated process, which makes it easier to learn especially for beginners in the welding field. Specifically, it uses an electrode covered with a flux that is consumable while in the process. It also uses the power source of either AC (alternating current) or DC (direct current) depending on classification, but mostly, DC is used by most types, and AC is addressed for the second option. To attach the material, it forms an arc between the electrode and metal by melting, resulting in a seeming puddle like form classified as weld pool. Also, the heat from the process also burns off the flux, which adds a protective sheet that causes the weld to be protected from other atmospheric gasses that may influence the quality. As it cools, it would form a layer of slag which has to be removed or chipped to solidify the joint. This indicates the ending process of the welding movement, and you can further check if the material is attached adequately before turning off the welding engine. Key Preparations before welding: How does it work? The type of welding can be associated with heavy duty type of work, such as for industrial steel and iron jobs. Though, before attempting to weld the two metals, it is crucial to assess the proper preparations in conducting a stick welding. The appropriate introduction can help save time and also ensures the credibility of the process, which is essential to prevent any mishaps that can occur. The stick welding both support AC and DC as a power source, though, it is preferred to use continuous voltage throughout the procedure. With this, it maintains a set voltage from the output current. This type of voltage is needed especially for workpieces that do not have flat surfaces and for short welds. It is essential to know what is the right electrode suitable for your work, as it plays a vital role in terms of the effectiveness of a welding project. Each has its unique properties, and so it is crucial to determine the parameters to properly evaluate. Specifically, you need to consider the welding speed, power supply, type and thickness of metal and the position at hand. For maximum welding speed, you should consider an electrode that oxidizes quickly to achieve fast solidification. For the power supply, some are at their potential characteristic depending on the preferred current as it affects their level of penetration to the base. The position of the welding process also matters due to the tendency of some electrodes that are designed for a specific position, but some work efficiently on all position. Furthermore, the electrode metal should match the base of the material to weld, and its thickness depends for the reason that the thicker the metal is, the stronger the tensile strength that requires deeper penetration. The equipment is needed to ensure that the workpiece is stabilized while conducting the means of welding. This provides a clean, accurate weld to the joint, in contrary to the sudden mistake that can be made due to little movements. Correctly, it is used for the material to be connected to the welding cable using the ground clamp. It can also be classified as a “stinger,” and its sole purpose is a clamping device to securely hold the electrode on its position. Its function lies on the attachment within the welding cable through the insulated handle. The holder is made with different sizes depending on the electrode that will be used. Specifically, each has a designated type of usage depending on the range of electrode diameters and the recommended welding current. The larger an ampere, the bigger the holder, for if the size is not met, it may overheat. Moreover, two types of electrode holders are generally used, and that is not insulated and insulated. The insulated holders are the most recommended since the non-insulated ones are prone to subjected accidental short circuit if it is made contact to the workpiece while on the process of welding. Aside from the preparation of equipment, you should also correctly clean the material. Even if stick welding is classified as the most forgiving process in terms of rusty welding metal, it is still highly advisable to clean it using grinder or wire brush to remove the rust and dirt on the specific area that needs the weld. Failing to do so may lead to lack of fusion or porosity. Also, ensure that you have a clean location for the work clamp. Test the position of angle while the welding is not on, to have an insight regarding the wanted position. Also, consider having a better view of the weld puddle, and at the same time, allows you to comfortably manipulate the electrode. Safety gear is also required before starting the process, and that includes protective eyewear and gloves. Even on the occurrence of wind or rain in terms of climate, stick welding is still useful. Easy to change the electrode rod for the connection of different metals. It does not need an external shielding gas bottle. The flux outside the filler already provides its purpose. It is classified as less sensitive to dirt, paint, or corrosion that saves time for crucial clean-up. The appearance is not necessary and does not need to look nice to ensure the strength of the connection. The stick welding is a slow process, as it is time-consuming to chip away the “slag” that formed on the arc. The slag should be removed for it absorbs moisture, therefore makes the joint difficult to accept paint. It shows difficulty in welding thinner materials. It is preferred to do outside as there are lots of splatter and smoke that can be produced while on the process. The welding electrode rod should be replaced more often than on any other types of the welding process. The current solely depends on your electrode, and that if it is suitable for DC positive or negative, or AC. The electrode positive provides more penetration at an amperage while the electrode negative proposes to weld thinner materials better. In terms of setting the amperage, it depends on the type, metal, and the diameter of rod that you possess which would be indicated on the electrode’s storage. Also, set up the amperage depending on the position, keeping in mind that the overhead work requires less heat than flat weld. If the electrode is sticky and is somehow resistant to flow on the process of producing an arc, chances are the amperage is too low than needed. Though, if the weld pool excessively flows and is hard to control, then the amperage may be set too high. This tendency can negatively affect the welding process, and so it is best to adjust the welding by 5 to 10 ampere to achieve the ideal setting. The arc length depends on two variations, which is the application and the electrode. To have a comparison in terms of the arc length needed, it should not be beyond the indicated diameter of the electrode rod. Failure to comply may result in long arcs with exceeded voltage, which produces undercuts, splatter, and leads to porosity. If an occurrence happens wherein you have trouble seeing the weld pool, it is advisable to move your head rather than settling for a longer arc. The position should always give you a better view while at the same time, allows you to manipulate the electrode steadily. In the long run, the ability to properly control the arc length can lead to improved bead appearance and minimization of splattered debris. For overhead and flat positions, use a welding technique that is widely known as “backhand.” In this case, the electrode should be located to the joint in a perpendicular position, with the tilted electrode with at most fifteen degrees. Also, for the process of welding that requires the position of vertically up, it is preferred to use a “forehand” technique. This can be done by tilting the electrode with at most fifteen degrees, then moving away from the direction of welding travel. The manipulation of the electrode depends on style, and you can develop your own by noting the acquired techniques to produce a better quality of the weld. In it, one of the conventional methods is the unnecessary movement of weaving the electrode for those that are thinner than ¼ of an inch, which means that straight beading is preferable. Though, to produce a bead, move the electrode by manipulating it to each side, forming a z pattern or semi-circle pattern. To cover the are wider, use stringer beads. In welding with the position of vertically up, direct it to the sides rather than the center of the joint, for a puddle would more likely form in that area. Move across the middle slowly, and watch the weld pool built up, and pause at the sides to ensure a solid sidewall. Traveling slowly can cause cold-lapping with a wide bead that exhibits shallow penetration. Its appearance seemingly looks like as if the weld pool is sitting on the surface, instead of binding the two metals. Though, the speed that acquires fast travel results to a narrower bead with decreased penetration that can raise the possibility of the welding to be underfilled. This can be seen when the outside appearance resembles a concave shape. With this, to have the correct speed, a sign can be distinguished wherein your travel should keep an arc in the lead of at least 1/3 of the puddle. Do I have to remove any remaining rust or oil on the surface before conducting the process of welding? The process of stick welding is the most forgiving in terms of cleanliness than any other types, but it is still recommended to wire brush the debris. It is in line with the proper preparation that one can produce a good weld, and in this case, can promote this occurrence. Not doing so introduces poor preparation that often results in lack of fusion between the strength of the connection. Are there any advantages when using an AC output? It is known that there is an advantage while using an AC output, especially if the material that needs to be weld has become magnetized with friction. This implies that a DC output is not preferable because of the occurrence of arc blow when using it. Arc blow is produced when the magnet somehow blows the seemingly molten rod in the puddle to the outward direction. Since the main key of AC output is that it exchanges between the two polarities, the magnetized material would not hinder the progress. For generalized usage, what type of stick welder works best? The type of welder with an AC and DC output can be used, even if it is an electric arc machine or a gas engine drive. Though, keep in mind that DC welding offers more beneficiaries than those with AC output for most applications. This includes less splatter, better appearance of the weld, smoother arc, and fewer sticking of the rod. Also, DC with reverse polarity provides more penetration than AC at a specific amperage while DC straight polarity can weld metals with thin characteristics. Final Thoughts: Weld your inhibitions away! Knowing the critical points in stick welding can improve your overall performance and output, which introduces the acceleration of strength across various metal joints. It is also crucial to have proper preparations before actually attempting to weld, as the structure solely depends on the start-up procedure and the ongoing process. 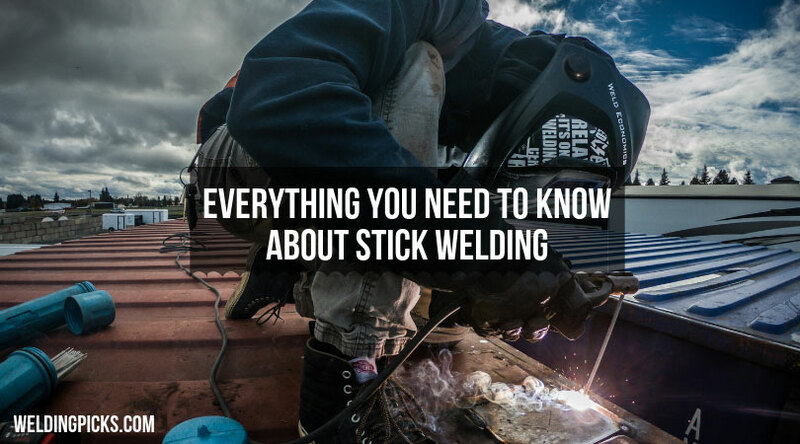 Also, it is also essential to evaluate your work and assess if stick welding is the most suitable process with the provided beneficiaries and limitations that it possess to ensure the credibility of connection. The supplied tips, along with proper practice and perseverance, will get you in the right direction to produce an excellent output with your stick welding technique!